Our very colorful ABC Truck is a one piece pickup truck, handmade from walnut and maple. 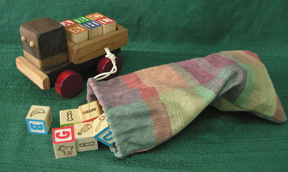 It has a bed in back which holds six 1 1/4 inch alphabet blocks, which are included, as cargo. Do you need a great baby shower gift? Or a baby gift for a newborn? The ABC Truck is perfect! It works for either a boy or girl and the alphabet blocks are “classic”. Many of our customers like to give the ABC Truck, especially when they do not know the gender of the baby. As a "first" truck for the little one who is just starting to crawl, the ABC Truck is perfect. There are not a lot of pieces to pick up and the child can get an early start on learning the alphabet. Putting the Alphabet Blocks into the bed of the truck and/or stacking the ABC Blocks are fun ways to increase eye/hand coordination. Do you remember the fun it was to build a tower and then knock it down? As an extra, to go along with the ABC Truck, you can purchase a Bag of Alphabet/Number Blocks. The drawstring bag is made of durable fabric (colors will vary) and holds 26 ABC Blocks, 10 Number Blocks (0 - 9), a "+" block and an "=" Block. With this bag and the blocks in the ABC Truck the alphabet will be complete (38 alphabet blocks in all). The Alphabet Blocks are made out of the country-the last remaining American small alphabet block manufacturer went out of business last year. We have been assured that the colors on these classic blocks are all child safe. Each of the alphabet blocks has 2 different alphabet letters. Two of the sides are upper case in color, two are lower case in stenciled form, and the remaining two sides contain two different pictures which start with the corresponding letters on the blocks. The Number Blocks each contain 2 numbers on 2 sides and 2 corrsesponding sides of "dots" to match the numbers. What a great early learning tool! Just click on “Additional Blocks” under the picture to add the Bag of ABC Blocks to your order.